For the first outing of our week in the Telluride area, we headed to Bolsam Pass and Blackhawk Mountain overlooking the small town of Rico, the Dolores River and SR145. I had tried to drive up the 7mi dirt road a few days earlier but had turned back when conditions grew muddy and a bit tenuous. Even in dry conditions I would not have gotten more than a few miles as we found the road grows suddenly rough after it crosses to the north side of Barlow Creek. Eric's Subaru was challenged by the conditions but it made it to the TH admirably. Much of the day's hiking would be along a southern section of the Colorado Trail, a 486mi route between Denver and Durango that spends most of its time above 10,000ft. The trail is open to foot, equestrian and bike traffic and appears to be quite popular, even if our out-of-the-way trailhead is not. I had gotten the idea for this particular outing from John Kirk who had posted on LoJ an impressive GPX track detailing a circuit that included another six peaks in the area, including Hermosa Peak which, like Blackhawk Mtn, is a P1K. There was no chance that I would get the others to either join me for such an extended outing or wait for me do them solo, but I figured anything I managed beyond Blackhawk would be considered a bonus. 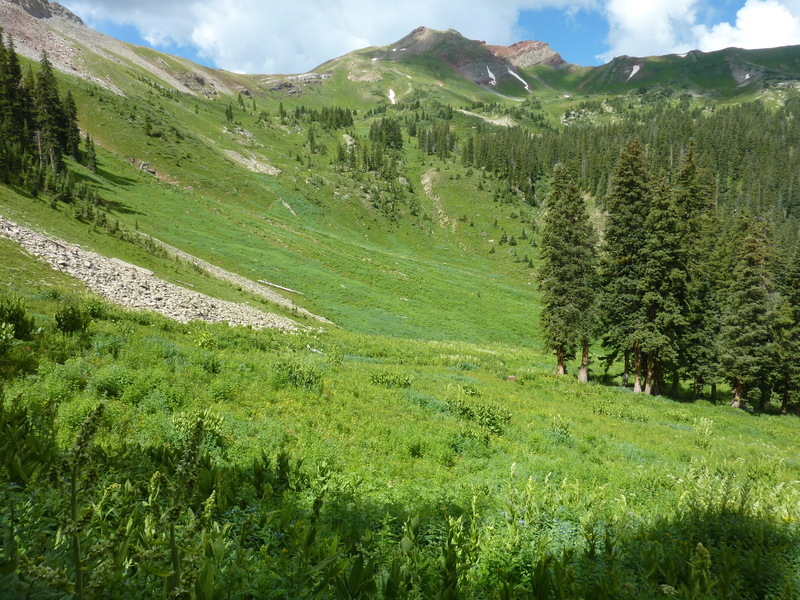 Blackhawk alone would be about 12mi and 3,000ft of gain in and out on the Colorado Trail. We started out around 9:15a which was only concerning because of forecasted afternoon thunderstorms. The previous two days started off overcast and no such storms developed until much later in the day so I wasn't worried initially, but with mostly blue skies at the start we were setting ourselves up for some wet conditions later. With the exception of Leroy, we all luckily carried the rain gear that would prove handy. Hermosa Peak looms large at the start from our trailhead, presenting a scree-filled North Slope topped by a cliff band on the uppermost ridgelines. The trail follows around the north and west side of the peak through the upper edge of forest. As always, Leroy enjoyed the outing tremendously, running ahead of us, chasing after pikas and marmots he had no chance of catching and no skills to root out, taking in all the smells of the forests and meadows we passed through. He would easily put in three times the mileage of his companions and barely looked tired, even after exerting himself on his cross-country forays up and down the steepest slopes. For their part, Steve and Eric did not quite know the extent of the outing I had planned. I think I underestimated the mileage to something like 5mi and only after we started did it dawn on them that this was one-way. When, after more than an hour of hiking I pointed out our first view of Blackhawk to the south, it still seemed quite far away. The good news was that the trail did most of the work, even going over a high pass between Blackhawk and nearby R1 to make the cross-country work relatively short. On the negative side, the sky began to grow crowded with developing dark clouds in many directions even before the first hour had passed. It took us two and quarter hours to reach the highpoint of the trail at the aforementioned pass where we found a trail junction with a sign pointing right, up a use trail towards our summit. This trail was useful for about half the remaining distance before it curved left and was buried under a sloping snowfield. The cross-country was not difficult though the terrain was somewhat steep. Steve fell behind as Eric, Leroy and I kept up a good pace for the top. Eric eventually relented too, so Leroy and I raced the last 100ft to the summit, Leroy easily beating me. The views were open in all directions and it was a little disconerting to see rain falling in other areas around us though there was no lightning - yet. Eric wanted to get down after an over-so-brief stay and was the first one to leave. Steve and I showed the usual CA ignorance and lingered longer, though we didn't stay much longer.